The No. 8 Arkansas Razorbacks have a spotless record in road baseball series this season winning at Southern Cal, Alabama, and last week at Auburn. The No. 6 Vanderbilt Commodores are likewise undefeated in five home series, defeating Pepperdine, Illinois State, Dayton, Florida, and Tennessee. One of those impressive marks is going to have to give as the Hogs and ‘Dores tangle in a pivotal three-game series this weekend in SEC play. First pitch on Friday at Hawkins Field in Nashville is 7 p.m. Friday on the SEC Network, 8 p.m. Saturday on ESPNU, and 1 p.m. Sunday on the ESPN streaming App. Of course, every week is a pivotal week in the SEC. Arkansas (24-8, 8-4 SEC) and Vandy (24-8, 7-5 SEC) are just two of the four SEC squads “Baseball America” ranks in its top 10 with No. 3 Georgia (27-6, 9-3 SEC) and No. 5 Mississippi State (27-6, 7-5 SEC). LSU (23-10, 8-4 SEC) comes in at 11th in the poll followed by Texas A&M (25-8-1, 7-4-1 SEC) at 14th, Ole Miss (23-10, 8-4 SEC) at 15th, and Auburn (23-9, 7-5 SEC) at 22nd. The SEC standings don’t exactly jibe with the national rankings at this juncture of the season. The Hogs, Rebels, and LSU are tied atop the West with 8-4 marks, followed by the Aggies, while the highest rated West squad Mississippi State is tied for fifth with Auburn. In the East, things are more clear cut at the moment with Georgia on top followed by Vandy. The rest of the East are all under .500 in SEC play. What that means for the Commodores and the Razorbacks is that the winner of their series will keep pace in the race for the SEC title, and remain in the hunt to host an NCAA Regional and possibly for a coveted National Seed. Losing the series wouldn’t rule any of that out for either squad, but it would leave either program bunched in the middle rather than out front at the midpoint of the SEC season. 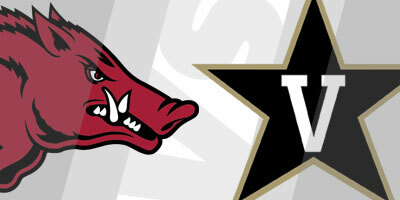 Following the Vanderbilt series, the Razorbacks hosts No. 5 Mississippi State April 18-20, and Tennessee April 26-28, travels to Kentucky May 3-5, host No. 11 LSU May 9-11, and closes out the regular season at Texas A&M May 16-18. As strong as most teams are in the SEC, technically one series doesn’t matter much more than another, but at the turn, it would certainly feel good if the Hogs remained near the top of the conference when they head home from Nashville. The Razorbacks would be right there if they are capable of winning two of three from the Commodores this weekend. The forecast for Nashville calls for rain on Saturday and Sunday, just like it does across most of the SEC landscape this weekend. It’s uncertain if all three game of this series or any across the league will be played. 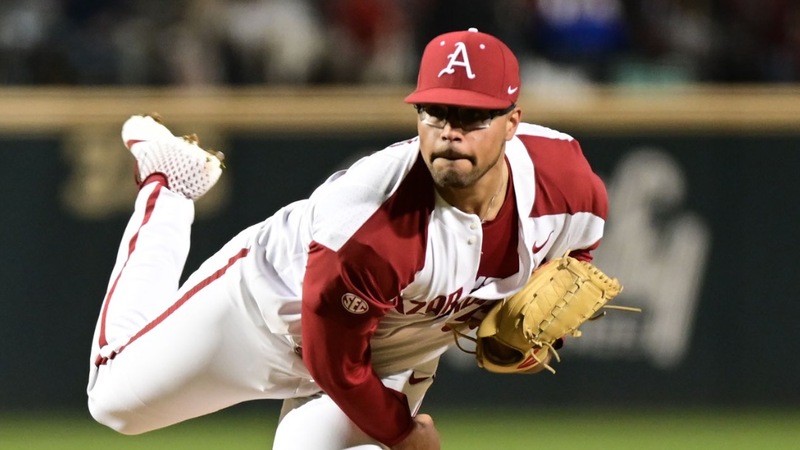 Last weekend was a gut check for the Razorbacks, who went into Auburn on a three-game losing skid after dropping the final two games to Ole Miss the weekend before and then falling to Arkansas-Little Rock in a midweek game. The losing streak extended to four with the Hogs’ lone Friday night loss of the season, 6-3 to Auburn. Last Friday, the Razorbacks’ pitching struggled in the back half of the doubleheader, and as it has all season in the second game of a series, Arkansas’ run production was low through the early innings of what developed into a 15-inning marathon. The Razorbacks’ season truly seemed to be on the brink in that marathon of a game in which the Hogs and the Tigers seemed to do just enough to stay knotted together inning after inning. The Hogs finally broke through with a three- run inning in the top of the 15th and had the grit and determination to hold off the Tigers to stake what could end up being a turning point for the Razorbacks this year. The Hogs whizzed through Saturday’s rubber match for an 8-0 victory and after falling behind early on Wednesday out-powered Oral Roberts, 15-8. The Hogs looked like a team that had regained its swagger in the two games since the 9-6, 15-inning victory over the Tigers. That said, the Commodores not only hold the home-turf advantage this weekend, but analytically hold a very slight advantage over Arkansas across the board. Arkansas ace Isaiah Campbell (6-0, 2.29 ERA) is set to start on Friday with freshman Connor Noland (0-1, 4.59 ERA) penciled in for Saturday. The Hogs’ Sunday starter is up in the air a the moment. This should be an exciting series, but that’s what we’ve grown to expect each week in the SEC.